CMS templates - and website templates in general - are a great way for the do-it-yourselfer and web professional to cut time and cost from their website development project. In fact since 2003, DMXReady has provided designers and website owners with the tools they need to create their own content management systems (CMS) websites, quickly and easily. What Are CMS Templates / Website Templates? In the old days, all websites were hand-coded. Then came HTML editors like Dreamweaver that made creating web pages easier. 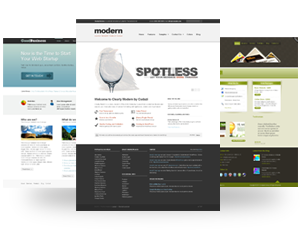 Design templates helped website builders by giving them a pre-built framework. But all of these still required the services of a web professional to some extent. DMXReady has taken the idea of website templates one step further, providing complete CMS templates that allow the average web owner to build their own websites. For example, DMXReady CMS Suite can be configured for almost any business. This makes it easier for you to design a website because we've already plugged in the applications, created the pages and navigation, and wrapped it around an easy-to-use content management system (CMS). All you have to do is choose your design (wrapbootstrap.com) and replace our content with yours. If you're not ready for a full makeover, DMXReady offers a whole library of website application templates that can plug into your existing website to extend its functionality. How Can DMXReady CMS Suite Help You? Let's say that you are setting up your own online storefront. What would you need? Where do you even start? Scratch the surface, and it quickly becomes apparent that building a website can be more difficult than simply installing software. You need to plan your website, build logical pages, and put it all together. ...unless you have DMXReady CMS Suite! Our built-in CMS templates allow you to choose the business case that suits you best to pre-install all the pages and applications you need. For example, let's say you want to open an online software store. Goal: To increase sales and provide easy, automated point of purchase system for customers. Create an online catalog of products, connect directly to your PayPal merchant account. Store all help files and documentation. Create a "Members Only" area of the website for premium content. Contact members/customers via built-in mail manager. Run your own blog and incorporate demos. Then, simply plug in a design template, add your content, and you're ready to go. Test-drive the CMS website template for software vendors. You Should Be Building Your Website from a CMS Website Template! After all, why wouldn't you want to make building a website easier on yourself? Even web professionals prefer to build from templates rather than start from scratch every single time. Built-in database that uploads with the Suite - no more fiddling with complex databases yourself! Intranet CMS website is designed for any organization that requires a "Members Only" password protected Intranet or Portal website. It includes specific features/functionality to build and maintain an intranet/portal website. Get the ISV CMS website that is Ready to install, customize and transform into a business automation system for Independent Software Vendors. Get a Church CMS website that is ready to install, customize and transform into a website management system for Churches/Charities. Get a Consultant CMS website that is ready to install, customize and transform into a business automation system for consultants. Get a School CMS website that is ready to install, customize and transform into a business automation system for education/learning providers. Get a Membership CMS website that is ready to install, customize and transform into a single system to launch and manage a club/association website. Get a Product Showcase website that is ready to install, customize and transform into a stunning product/service showcase website. Get a Webzine CMS website that is ready to install, customize and transform into a business automation website for Blog/Webzine publishers.